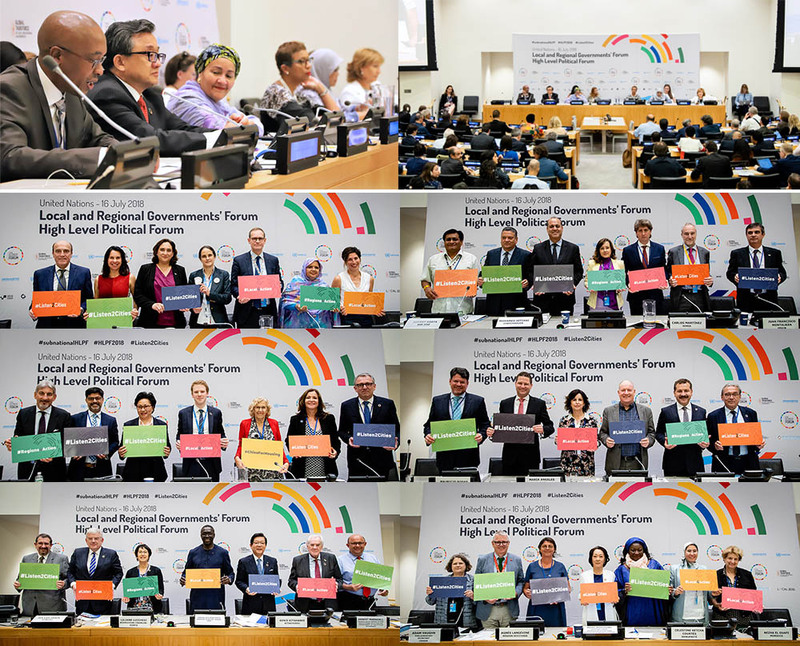 Over 240 local and regional governments representatives, including 70 Mayors and Regional Presidents, carried out joint mobilization at the 2018 High-Level Political Forum (HLPF) to convey local perspectives on the localization of the 2030 Agenda. For the first time ever, the HLPF included an all-day meeting of local and regional governments with United Nations high-level representatives, national governments and civil society. Over 65% of the targets linked with the Sustainable Development Goals (SDGs) are directly related to local basic service provision: from water and sanitation to elementary education, energy consumption and accountable institutions. Indeed, the achievement of the SDGs and the review of the goals are an integral part of UCLG’s overall strategy. This is why local and regional governments are demanding a permanent seat at the global table and working towards a more collaborative model of governance. The Local and Regional Governments’ Forum was a key milestone towards this end. The local and regional governments’ delegation was present through most part of the HLPF; however, the largest delegation attended from 15th to 18th July. UCLG was strongly represented through its Presidency and members. Parks Tau, President of UCLG, on behalf of the Global Taskforce, addressed the Local and Regional Governments’ Forum during it Opening Ceremony. Furthermore, Parks Tau co-hosted a high-level luncheon with the Deputy Secretary-General of the United Nations Amina Mohamed, where direct exchanges were facilitated with the broad delegation of local and regional governments. 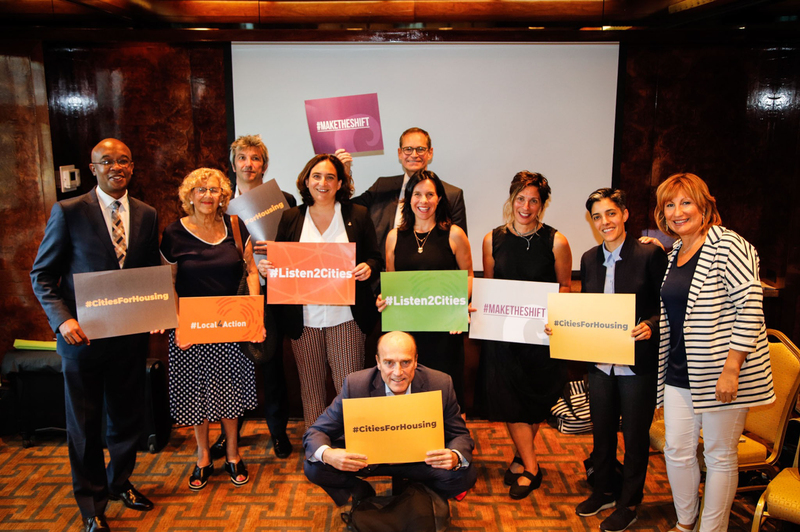 Among the mayors attending the HLPF were: Ada Colau, Mayor of Barcelona and Co-President of UCLG; Michael Müller, Mayor of Berlin and Vice-President for Metropolis; Daniel Martínez, Mayor of Montevideo; Valérie Plante, Mayor of Montreal, Carlos Martínez, Mayor of Soria and Vice-President of UCLG for Europe; and Fatimetou Abdel Malick, Mayor of Tevragh-Zeina. In addition, Lalao Ravalomanana, Mayor of Antananarivo; Peter Kurtz, Mayor of Mannheim; Marcelino Chumpi, President of Morona Santiago; Manuela Carmena, Mayor of Madrid; and Johnny Araya, Mayor of San José participated in the Forum. The delegation included Yücel Yilmaz, Mayor of Karesi; Berry Vrbanovic, Mayor of Kitchener and UCLG Treasurer; Kenji Kitahashi, Mayor of Kitakyushu; Mauricio Rodas, Mayor of Quito and Co-President of UCLG, and Roland Ries, Mayor of Strasbourg and Co-President of UCLG. Finally, Ashok Sridharan, Mayor of Bonn; Mohamed Sefiani, Mayor of Checfchaouen, Jan Van Zanen, Mayor of Utrecht and Agnès Langevine, Vice-president of Occitanie were also part of the delegation. UCLG convened a meeting of the Global Taskforce, Cities Alliance and UNACLA to set the scene for the HLPF and adopt a joint statement. A special session, led by the UCLG Committee on Social Inclusion, Participatory Democracy and Human Rights, was the occasion for Ada Colau, Mayor of Barcelona and Co-President of UCLG, will present the Cities for Adequate Housing Declaration, which aims to rally cities from all continents to fight the housing crisis affecting urban dwellers worldwide. This special session emphasized the need for a rights-based localization of the SDGs by calling for an effective implementation of the right to housing in cities. For the first time ever, the Local and Regional Governments’ Forum took place in the framework of the HLPF. 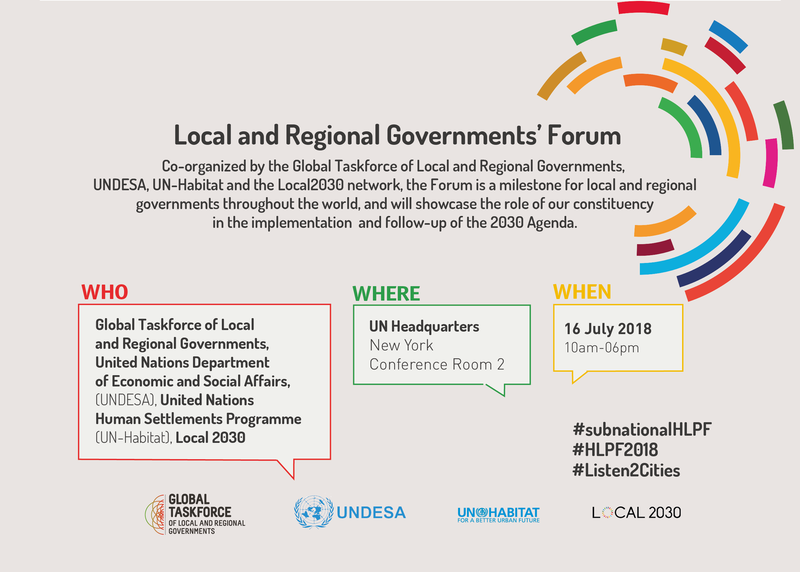 Local and Regional Governments’ Forum co-organized by the Global Taskforce, UNDESA, UN-Habitat and Local2030 took place on 16 July. The Forum provided a key opportunity to present the role of Local and Regional Governments in the localization of the global agendas and to call for the inclusion of their perspectives in the global assessment process. The Forum was organized around six different panels addressing key issues for the localization of the SDGs. Panel 1 will address the implementation of SDG 11 and its key interlinkages with other SDGs, including housing. Panel 2 will explore local involvement in the reporting process and will provide recommendations in this regard. Panel 3 will showcase the importance of integrated territorial planning to build resilient, inclusive and well-connected communities. A fourth panel will highlight the need for re-thinking sub-national financing systems to accelerate the implementation of global agendas. Panel 5 will address the need to set up a monitoring system that works at local level. Finally, Panel 6 the coherent and inter-linked nature of implementation of multiple global agendas on the ground will be discussed. Another key moment for our constituency at the 2018 HLPF was the discussions around the Local 2030 Hub: Local Action for Global Commitments on 17 July. Complementary to the political statements delivered the day before, the Local 2030 event provided a special space for dialogue between the UN and the constituency of local and regional governments to explore the challenges and opportunities that local leaders face when implementing the SDGs. The Hub focused on concrete solutions to accelerate local action in areas such as financing, capacity building in humanitarian and conflict settings, data solutions, climate and energy. Participants included representatives of national governments, local governments, the private sector, civil society, academia, and UN leadership. The delegation of Local and Regional Governments presented the second report on the role of local and regional governments in the localization of the SDGs. 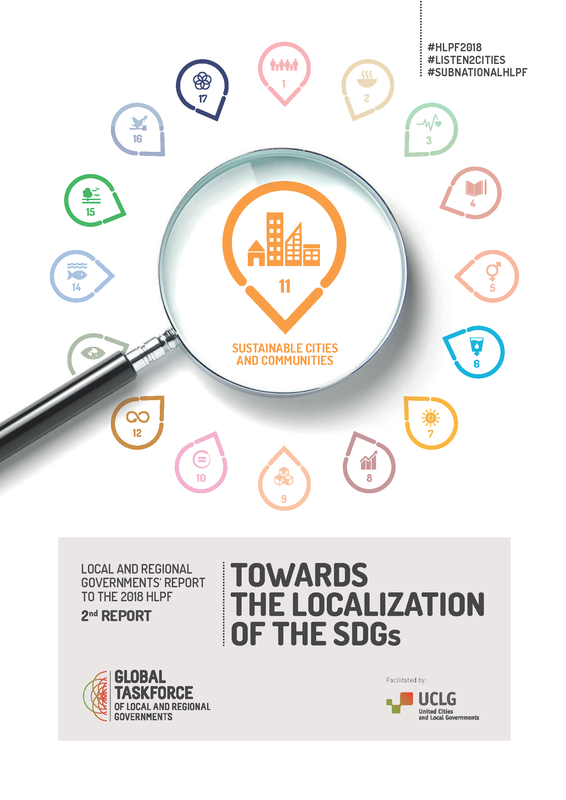 This report is a contribution from UCLG, as facilitator of the Global Taskforce, in an effort to benefit the broader local and regional government constituency. The report builds on three different sources: a UCLG survey to networks of local governments; analysis of 48 Voluntary National Reports (VNRs), and regional experts. The report offers evidence from the ground on the importance for SDGs localization of basic services provided by cities. It also shows why local and regional governments need an enhanced access to adequate capacities and financial resources to deliver on the global goals. Mayors from around the world conveyed a common reality to the international community: cities and territories are already implementing the global agendas at the local level through their public services and policies. In order to guarantee their voices are not missed, cities need a permanent seat at the global table, as part of a more collaborative model of governance. We will continue to raise our voice with the #Listen2Cities campaign, as it has proven to be incredibly successful in raising awareness of the role that local and regional governments need to play at the global table. Local and Regional Governments remain boldly committed to achieving the SDGs and leave no one behind!